S'mores Shake Recipe it's Everything You Love in a S'more and More! 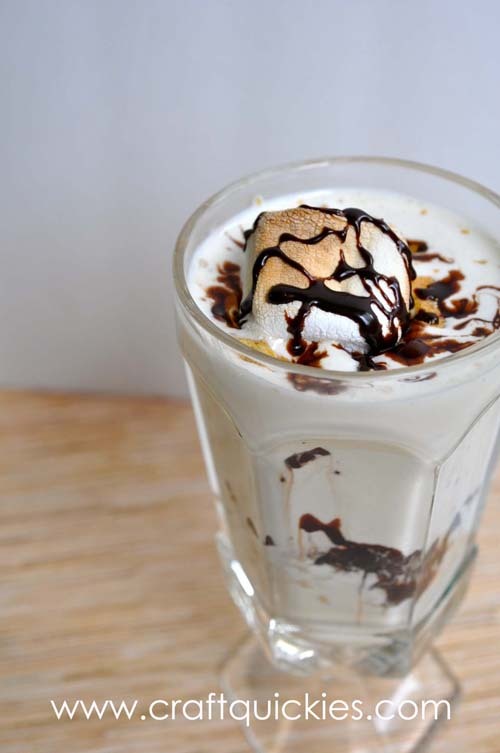 This s’mores shake recipe is the result of a couple of serious obsessions found in our home. I have a serious s’mores fetish. SERIOUS, people! If it says “s’mores” in the title I will Pin it. No joke. Just ask my sister. She is almost as bad as I am! My husband is a foodie. 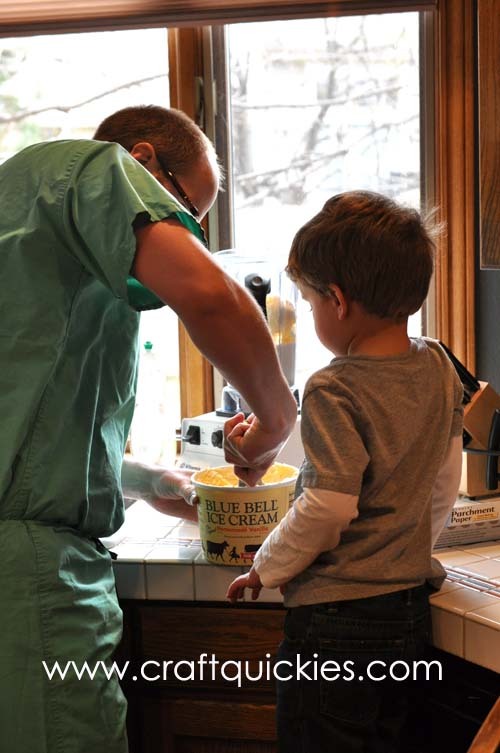 He loves to cook and experiment, although he rarely has time since he’s an exhausted and overworked medical resident. But milkshakes are not time-consuming or preparation-intensive, so ever since my dad got one of the amazing Vitamix blenders my husband has developed a milkshake fetish akin to my s’more fetish. And then we decided to combine our passions, and thus it was born: the S’mores Shake recipe. It’s easy and simply divine. Want to make one for yourself? Here ya go! This delicious milkshake is essentially a roasted marshmallow shake with s’mores trimmings. We use a Vitamix mixer, which is quite large, so you may have to shrink this recipe down some for your mixer. 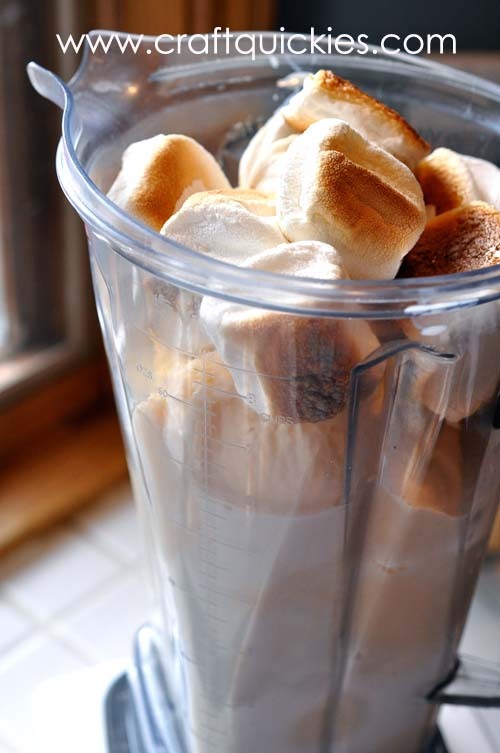 Begin by prepping the marshmallows for this s’mores shake recipe. Did you know that you can toast them in the oven? You can! I think that discovery may have a very bad effect on my waistline…. Line a cookie sheet with parchment paper and set your oven to broil. 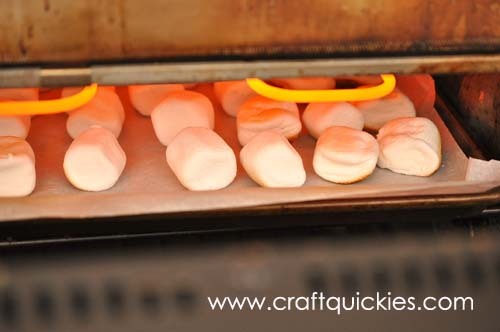 Move your oven shelf to the top setting so that your marshmallows can broil properly. 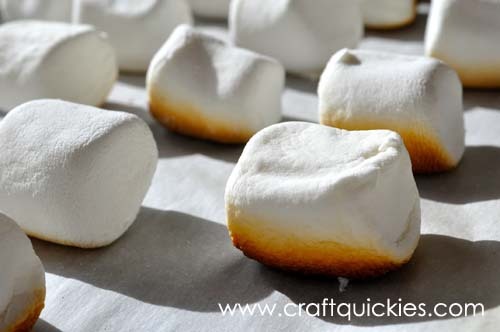 Line up about 20-25 large marshmallows up on the parchment paper and put them in the oven to broil. LEAVE THE OVEN DOOR CRACKED AND WATCH THEM! It only takes about 30 seconds. Take them out and let them cool for a bit. Then flip them over and toast the other side using the same technique. Time to get blending! Don’t forget: we used a large blender, so you may want to reduce these amounts! 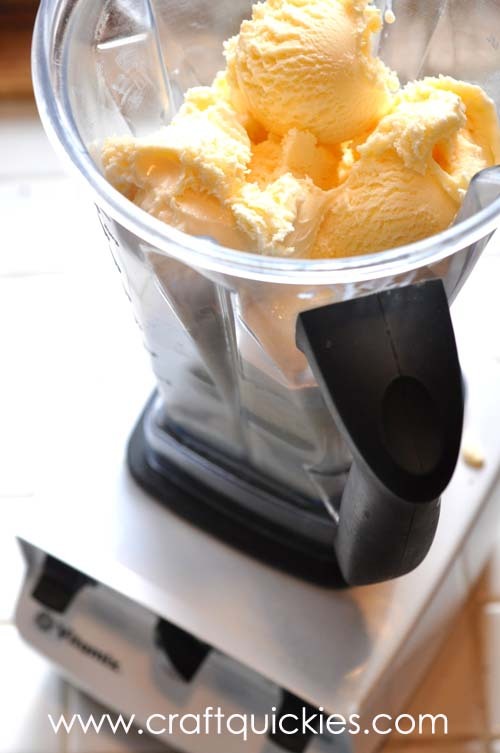 Pour about 1 1/2 cups of milk into your blender, and then fill your blender with vanilla ice cream. We used about a quart of ice cream. Blend well. Time to add your marshmallows! *Reserve a marshmallow for the top of each s’more shake! It’s the perfect garnish! * Blend very well. My husband thought I was nuts when I said that we should add all twenty, but I was right. It was marshmallow rich and oh-so-divine. You may want to only add a portion of them since this is the part that seemed thicker and slower to blend. 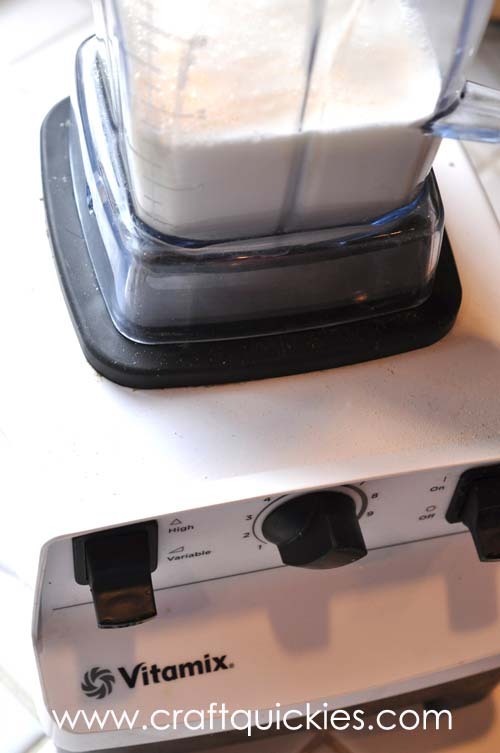 20 marshmallows is a lot of stickiness for a blender to take, even a Vitamix! 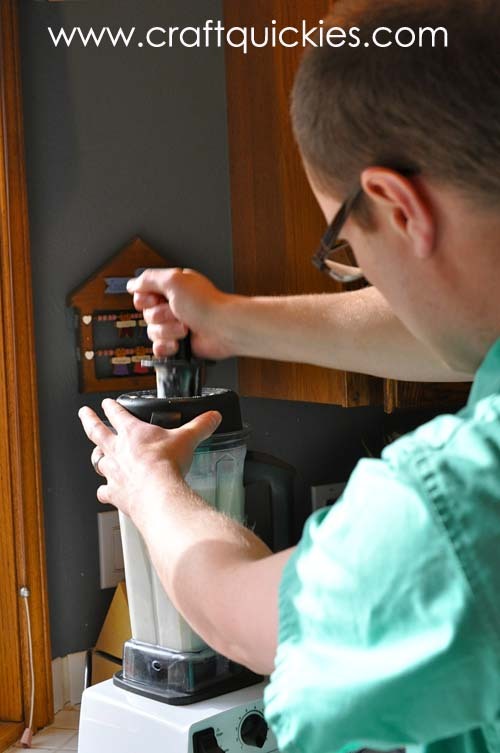 Luckily, the Vitamix has a handy feature where you can use a stick-thingy (yes, that is the official name for it…) to push down the items in the blender to help them blend, as demonstrated below by my handsome hubby. Done blending! Time to garnish! Crumble graham crackers and layer them into your shake or sprinkle on top. Do the same with drizzles of chocolate sauce. We used a hot fudge sauce. Top with your toasted marshmallow and you are done! Now eat up! YUMMMM….. You won’t be sorry that you tried this! What is your food obsession? Are you a fellow s’mores or milkshake lover? What makes you Pin like mad? For more s’mores recipe inspiration see the S’mores Saturdays Series on my blog or my S’mores Recipes board on Pinterest! I have problems. Yummy, yummy problems. Sarah is the scattered creative mind behind Bombshell Bling. A former elementary school teacher and a current stay-at-home mom, she loves developing her creativity through her blog and her jewelry design business, Bombshell Bling Jewelry. Sarah is a lover of all things vintage, colorful, and BLING. She is also a sweets addict with a major obsession with s'mores. I NEED this!!!!!! RIGHT NOW. I can just imagine how delicious this must taste! Can’t wait to make all the family will think it’s wonderful! 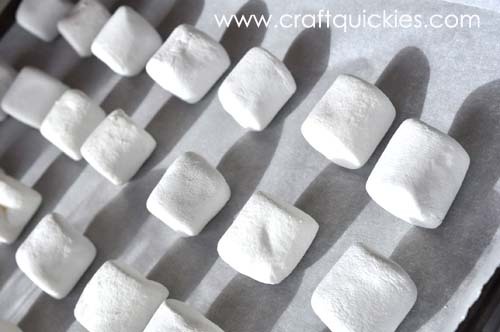 Love this – the boys are always asking to go out and make smores on school nights – this is an easy way to make them happy! This looks to die for and a perfect cooler summer treat than the traditional hot s’mores! My kids are going to love making this shake! Yum, thanks for sharing the recipe! I can’t even describe how badly I want this right now!! Yummy! That looks like the perfect summer dessert there! Oh.Em.Gee! S’mores are my absolute weakness! I am so making this this weekend…May have to add some marshmallow fluff vodka, since we’re teething over here. Ha! YUM!! Oh my these look amazing! Looks so yummy! Wanted to let you know that I’m doing a round up of recipes that I can’t wait to try in the near future, and I’d like to include this one. I will be listing the name of your recipe, linked back to your site, as well as your site name. A photo will be in a collage format only, so that your picture cannot be “swiped” from my site. And there will be no information about the ingredients or recipe steps so that readers must come visit you if they want to know how to make it! This will go live on the 13th; please do let me know if you don’t want me to link to you for some reason. I hope it brings you a lot of traffic! Go for it! That is always ok with me! We have a little bit of a s’mores addiction in our house too! Hence the reason for putting together our S’mores Summer Bucket List – http://joannwoolley.blogspot.com/2015/06/smores-21-ways-summer-bucket-list.html – oooh I should add you! A s’mores milkshake? That sounds awesome! I think I’m going to have to try this recipe for myself (and I know my girls would love it, too)! Thanks so much for linking up with Share The Wealth Sunday! This looks great! Thanks for linking up to Tasty Tuesday! I am featuring your recipe on today on this week’s Tasty Tuesday! Hope you’ll stop by. I’ve pinned this to the Creative K Pinterest board. I am a huge fan of smores and this looks so yummy! Thank you for sharing at Dishing it and Digging it link party. Oh my goodness. I love s’mores, so this is right up my ally! !